I’m so excited to finally be able to announce that TheraSpecs Pilot, an aviator frame with a curved lens for maximum light protection, is now available. I’ve been wearing a prototype for months and love them so much that I’ve been dying to tell you about them! Although Pilot looks like a classic aviator from the front, the lenses are curved for a wrap effect, so they block light really well. 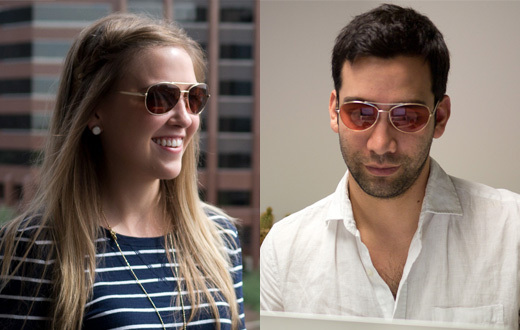 The golden metal alloy frame compliments the rosy hue of the TheraSpecs tint, plus it is very lightweight. Add in soft silicone nose pads and spring hinges and this eyewear is super comfortable in addition to looking great. Although aviators aren’t usually my style, I like Pilot so much that I wear them almost exclusively as my indoor frame. Even better, we’re offering a 30% introductory discount off the regular price of $99 for indoors and $129 for outdoor polarized lenses. Order your Pilots this month and you’ll automatically receive the discount — that’s $69.30 for a pair of indoors and $90.30 for outdoors. TheraSpecs Classic, our newest, lightest, and most affordable frame style is now available! As you can see, this timeless style looks great on both women and men, whether worn indoors or out. Plus, they weigh in at only 22 grams. Classics are only $99 for indoor lenses and $129 for polarized outdoors lenses. Classic frames can also be ordered with prescription lenses for a slightly higher cost. Email us for details on Rx orders or on sending in frames for totally custom TheraSpecs at custom@theraspecs.com. Wondering why I’m advertising migraine glasses? 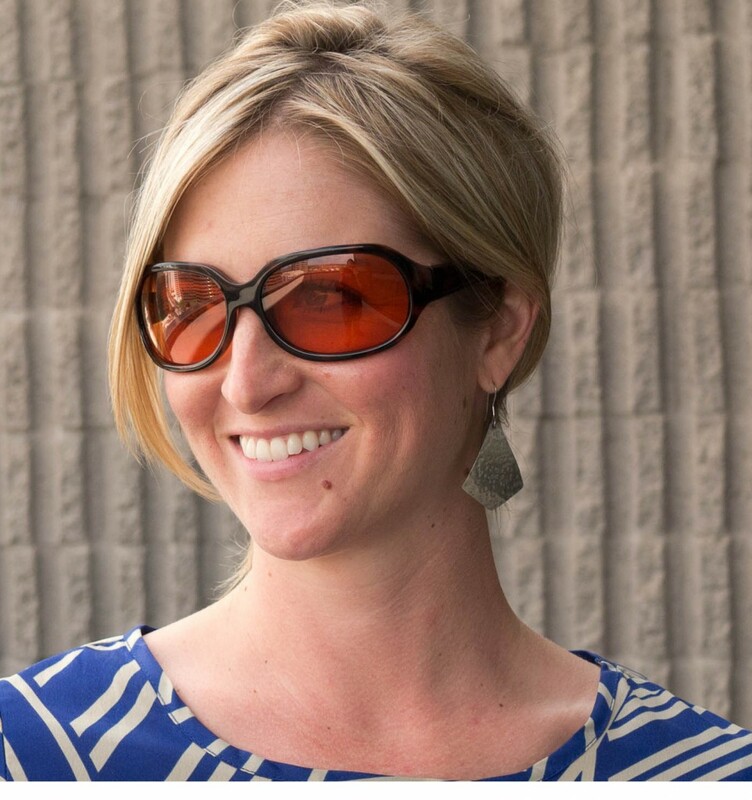 TheraSpecs is the company my husband, Hart, and I started after my neurologist told me that wearing sunglasses indoors was increasing my photophobia. He told me about a special tint that reduces light sensitivity, but I had trouble ordering glasses with that tint. Hart used his product management background to source frames that fit all my requirements and I loved them so much that we decided to start a company to make them readily available to anyone who is sensitive to light. You can read about our journey to start TheraSpecs in Big News for Relief From Photophobia & Sensitivity to Fluorescent Lighting (CFLs) and learn more about TheraSpecs on our website and by following us on Facebook and Twitter. TheraSpecs Migraine Glasses Featured on TV Show The Doctors! I’m also glad that the entire segment on migraine has pretty good information. My main quibble is with the statement, “There are always certain foods for some people that will bring on migraines.” Not everyone has food triggers and those who do don’t always get a migraine attack after eating their trigger foods. Also, I believe the audience member’s question is why preventives that once worked stop working, but the response addresses overuse of painkillers and abortives. These issues seem more like unclear communication than inaccurate information. Not bad for covering a huge topic in only three-minutes. Like the idea of TheraSpecs to minimize migraine triggers, reduce photophobia, and relieve fluorescent light sensitivity, but want a different frame than our traditional wrap? Check out Stella from our fashion line, Over-Rx for prescription glasses-wearers, or get a custom pair made to your exact specifications. TheraSpecs Stella‘s on-trend styling and dark tortoiseshell finish look great while providing maximum protection from light with TheraSpecs’ therapeutic tint. I’ve been wearing the prototype around for a couple months. Not only have I gotten tons of compliments on the prototype, my sensitive head loves how lightweight and flexible they are. Check out Stella Indoor, Stella Outdoor, or the discounted Stella Combo. For people who wear prescription glasses and want maximum coverage at minimal cost, TheraSpecs Over-Rx frames are an excellent solution. We worked extra hard to find the perfect material so they’re comfortable and lightweight even when worn over glasses. I wear them daily whenever I’m wearing glasses instead of contacts. Available in Over-Rx Indoor, Over-Rx Outdoor, and a discounted Over-Rx Combo. We also offer custom TheraSpecs to provide just about anything you are looking for, be it prescription lenses, readers added to any of our styles, or our lenses in your own frame. Is headache or migraine relief what you’re really wishing for this holiday season? 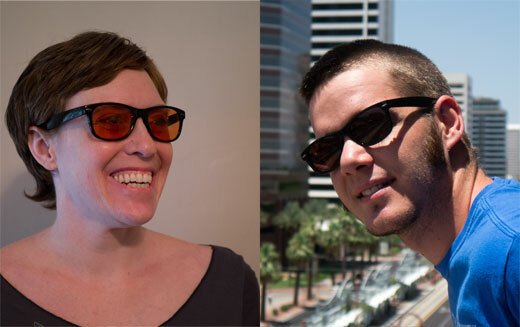 TheraSpecs are on sale through the end of the year, so treat yourself or a loved one! Use code WQTQ3QPTN3 in the checkout to get 20% of all indoor and outdoor TheraSpecs or 10% off our already-discounted combos. The code is good through the end of this year.